When I’ve left home the past two or three years for deer camp, I’ve received the standard hug and kiss from my wife, followed by a demand: “Bring me back some antlers.” When I return, the first questions aren’t about how it went or if I had fun. Nope – just an expectant, hopeful look, which I crush with my story of having fun, but no deer, blah blah blah. Last year, I considered asking someone else for antlers from their deer. Or buying some. And I may have done it, had a buddy of mine a couple of months ago not seen two bucks in the big, marshy area that abuts our yard. “Look at that rack!” he said. I didn’t realize right away what he was referring to, but when I looked where he was looking, it became clear. About 20 yards beyond our property was a big-racked buck, and a smaller one following him. Later on, I shared the story with my neighbor and he said he, too, has seen a nice buck down there. So the old boy must live in the marsh and patchy woods that back up to our yard. The thing is, this is in Bloomington, and so I’ll never be able to shoot him with a bullet or an arrow. My best hope is to find his antlers on the ground. I believe mice and other critters will be my primary competition. While I see people back there from time to time, they all seem to be just out for a hike, not looking for bones in the snow. When I set out on a recent Saturday, it was my first time hunting for sheds. I’ve read a bunch of articles about shed hunting, and have hunted deer long enough to have an idea of how they behave, so I’m relatively optimistic I’ll be able to find something. Plus, I’ve seen deer in the area a number of times, and with fresh snow, it’s impossible to miss all the deer sign. 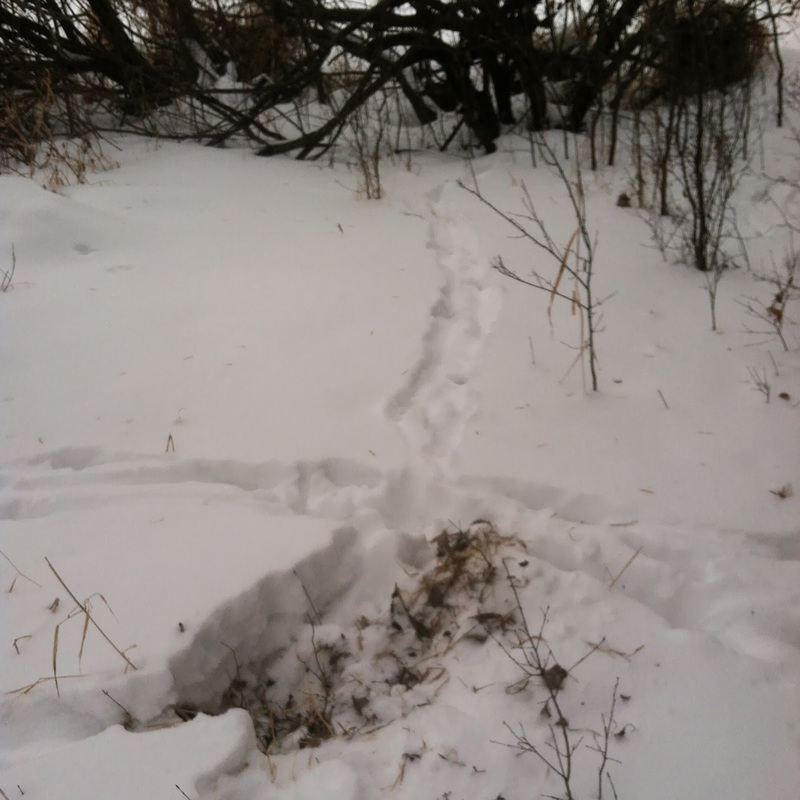 The big marsh is east of our house, and I cut a bunch of deer tracks as I walked toward it. I followed some, but stopped when the marsh grass got too dense. There may be sheds in there, but I won’t find them. So I made a quarter turn and headed south, following the edge where the woods meets the marsh. Several times I followed a trail into the woods, but more out of curiosity about how they move through the area rather than belief I’d find antlers. Finally, I walked out to the edge and headed south again, to the spot 150 yards in front of me. This is a south-facing slope that flattens and then meets the marsh. I figured this would be were deer spend a lot of their winter, soaking up the sunlight while staying in the protection of the woods. And I was right. Tracks crisscrossed the area, and there were at least four recently used beds. I spent a few minutes looking through the area, focusing primarily on the patches of heaviest cover where I could envision an antler getting caught and falling off.